Campus will be abuzz this fall during CBT XII Sept. 14-17, Orange Central Oct. 5-8 and Family Weekend Oct. 13-15. 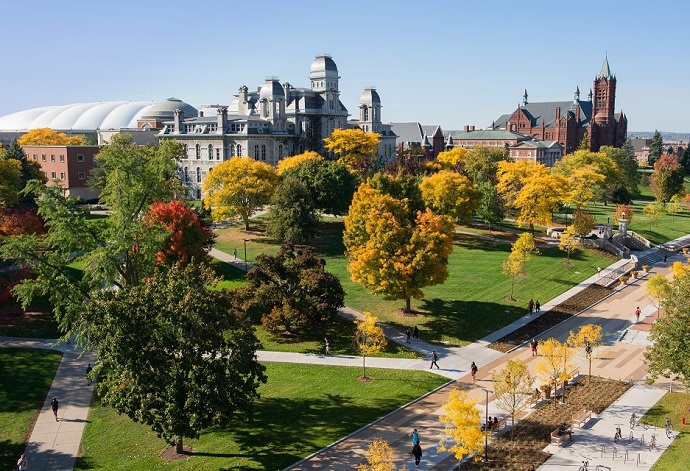 Alumni, family and friends are invited to spend time on campus this fall during three exciting, event-filled weekends that celebrate what it means to be Orange and highlight all that we are proud of at Syracuse University. Registration is now open for Coming Back Together XII (CBTXII), which brings African American and Latino alumni back to campus. Hosted every three years by the Office of Program Development, the reunion weekend offers students an opportunity to meet prominent alumni of color. With a reunion theme of “Celebrate, Inspire, Empower”, African American and Latino alumni enjoy CBT weekend by reconnecting with one another, sharing their secrets to success, supporting SU scholarship funds, and promoting their vision of how to keep the University moving forward. CBT XII will be held Sept. 14-17. For more information, visit http://programdevelopment.syr.edu/events/coming-back-together-xii/. Orange Central 2017 is the once-a-year homecoming and reunion celebration for everyone who loves the Orange. Syracuse University alumni, students, faculty, staff and friends enjoy dozens of activities, and the connections made between students and alumni are always a highlight of the weekend. Orange Central is slated for Oct. 5-8. Check http://orangecentral.syr.edu for the most current information on events. Registration details will be announced in the coming months. The following weekend, Oct. 13-15, family members are invited to experience life on the Syracuse University campus during Family Weekend. Coordinated by the Parents Office, Family Weekend offers loved ones the chance to meet their student’s dean and faculty members, attend campus lectures and events, eat together in the dining halls, explore campus buildings and get to know the City of Syracuse. Registration and events information will be available starting July 17. Visit http://parents.syr.edu/family-weekend. Interested in catching a football game while you’re here? CBTXII weekend features Syracuse vs. Central Michigan on Saturday, Sept. 16. Orange Central weekend features Syracuse vs. University of Pittsburgh on Saturday, Oct. 7. Family Weekend features Syracuse vs. Clemson on Friday, Oct. 13. Visitors can purchase tickets to these games and others at http://www.cuse.com/tickets/.